The 9th Annual Men’s Health Menswear Collection Fashion Show Will Be Hosted At Shimmy Beach Club. The eagerly anticipated Men’s Health Menswear Collection fashion show and VIP event is coming back to Cape Town – and promises to be bigger and slicker than ever! In association with First Instinct, a fragrance by Abercrombie & Fitch, the 9th annual show will be hosted at the Shimmy Beach Club on 21 September 2016. Aptly themed Hot in the City, this year’s event will feature the latest ready-to-wear fashion from some of the most popular South African and international fashion brands, providing a world-class platform to showcase some of the latest fashion collections from a number of menswear ranges. Launched in 2007, Menswear has cemented its presence as one of the must-attend events on the fashion calendar – with celebrities, stylists, local fashion icons, trendsetters and VIP guests all gathering under one roof to watch 15 of South Africa’s leading fashion brands on the runway. Expect appearances on the runway from well-known faces, including recent Men’s Health cover stars. The Men’s Health Menswear Collection fashion show is brought to you by First Instinct, the premium fragrance created by the global retailer, Abercrombie & Fitch. Much like the theme for this year’s show and the Men’s Health brand, First Instinct is all about quality, craftsmanship, being bold and making a statement. Head down to Shimmy to mingle with some of the country’s biggest fashion icons at the hottest event! Only a limited number of tickets will be available – book early to avoid FOMO! The event will also be open to the public from 22:00 pm, be sure to catch the after party with your mates. This year the Men’s Health Menswear Collection 2016 is held at the Shimmy Beach Club in Cape Town. 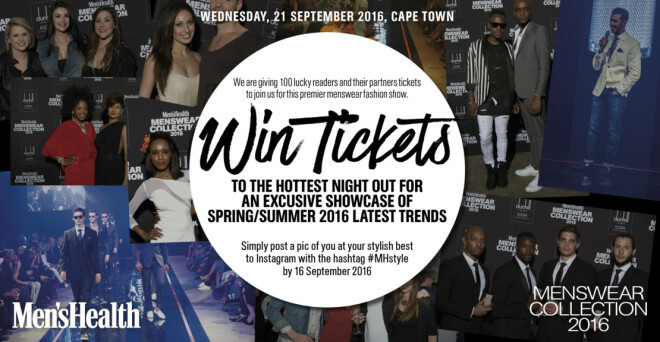 You and your partner could WIN tickets and get the opportunity to dress up and rub shoulders with Cape Town’s best-dressed. The prize is valued at R2,000 and includes canapes, drinks and goodie bags! Like this blog post in the top left and become a fan of Mr Cape Town Blog on Facebook. Follow me on Twitter @MrCPT and Instagram @mrcapetown. Head over to [this post] on Facebook. Like, share and tag your party partner you want to join you at this exclusive event! For more tips on what’s trending in men’s fashion and how to incorporate these essential trends into your wardrobe, look out for the Men’s Health Guide to Style September issue, which goes on sale on 22 August. Visit mh.co.za for more information. Follow the brand at @menshealthza and #MHStyle on Twitter, and visit the Facebook page at facebook.com/MensHealthSA.